Invicta FC 26 was last night in Kansas City. When I previewed this show, I thought it was an OK show with a weak main event. The show went as I expected. In the main event, Jennifer Maia retained her Invicta Flyweight Championship by unanimous decision over Aga Niedzwiedz. All three judges scored it 49-46. I scored it 49-46 for Aga. The problem with the fight is it was mostly uneventful. I was not surprised by that as neither fighter is very dynamic or aggressive and they don't finish fights. So for example, nothing much happened in round one until Aga scored a takedown and some ground and pound near the end of the round. I felt she stole the round. The whole fight was like that. The worst was round three which was mostly clinching against the fence. Ref Greg Franklin refused to break it up. If Aga had been more consistently aggressive, she would have won the fight. But she wasn't. I don't blame the judges because these type of fights are impossible to score. You're depending on the ref to scold them about lack of action but many refs won't do that. It didn't surprise me. That's how these two fight. In the co-main, BJJ whiz Mackenzie Dern made her Invicta debut with an easy win over Kaline Madeiros. It was funny to hear TJ DeSantis and Julie Kedzie repeatedly put over Kaline as a former Strawweight title contender. I didn't think she was deserving of a title shot in the first place. As expected, it was an easy win for Mackenzie mostly with striking but she finished with a third round armbar. Mackenzie is UFC bound. It's just a matter of time. For me, the only question is weight class. She's very big for a Strawweight and she missed weight in the LFA. I think she has two more Invicta fights and then the UFC. Janaisa Morandin was supposed to fight MIZUKI. But MIZUKI dropped out due to an elbow injury. She was replaced by Kinberly Moraes. Both fighters are from Curitiba, Brazil. I saw Kinberly lose to Syuri Kondo in PANCRASE. Her endurance is an issue. And that is why Janaisa won by unanimous decision. I think both are midcard fighters. In a Flyweight bout Vanessa Porto beat Milana Dudieva by third round TKO. Milana got the jump on Vanessa via a fence grab that ref Mike England missed. But Vanessa came back mostly with body shots. I think Milana broke a rib. In a Strawweight bout, Brazilian Virna Jandiroba beat Amy Montenegro by first round armbar. Virna looked good but I would like to see her against better competition. In an Atomweight bout, Amber Brown halted a three fight losing streak with a first round armbar win over Tessa Simpson. Amber missed weight and afterwards said she plans to fight at Strawweight. I like Amber but I think she's too small for Strawweight. In a Flyweight bout, Karina Rodriguez won by unanimous decision over Christine Ferea. Karina looked good but again I would like to see her against better competition. And in the opener, Kay Hansen won over Emilee Prince with a first round armbar. Both were making their pro debuts. Kay is young so she has promise. 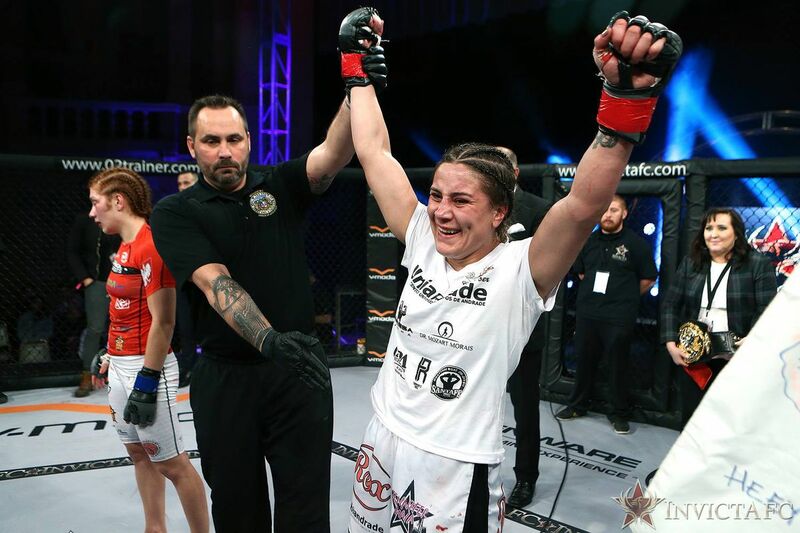 Invicta has signed Sarah Kaufman to appear on their Jan. 13 show.